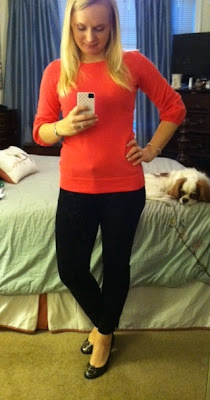 The Blush Magnolia | a southern lifestyle blog: Birthday Girl! Today, I am the birthday girl. It is my twenty-fifth birthday. But nevermind the year. My biggest birthday gift is getting a two and a half day week at work. In a little more than forty-eight hours my mom will be here to celebrate Thanksgiving. I am super excited because I've really been craving some family time with my family lately. I have absolutely the best in-laws I could have ever asked for, but living so far from home causes me to really miss my own mama sometimes. Unfortunately, my dad couldn't travel with her this time which has me a little bummed but we'll make the best of it. We are looking forward to Thanksgiving, wine, mani/pedis, and going to see the Broadway play Jersey Boys. We had a fun and relaxing weekend. Our Friday night was really low key and consisted of snuggling up watching numerous episodes of How I Met Your Mother on Apple TV and then we met up with some friends Saturday to watch the Clemson v. NC State game. Corey won major husband brownie points when he got me the most amazing birthday present. 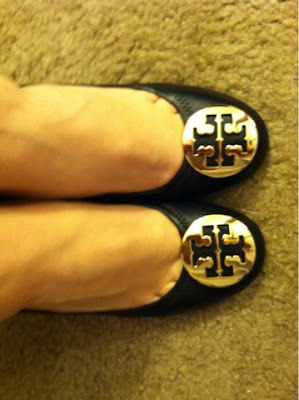 The Tory Burch Sophie Wedges that I have wanted for an entire year! Love, love, love! I'm wearing them with my Sloan skinnies and a Lilly sweater for work today. I'm hoping for a great work day without too much traffic. Ever since Sandy, my commute has been killing me! Happy Monday, girls! Happy Birthday!!! Love the Tory Burch wedges! Happy birthday!! Love your shoes. Hubby's a keeper! Happy Birthday, Elizabeth! 25 is a great age. Happy Birthday!! Love the new shoes, enjoy the time with your mom!! Happy, Happy Day! Love your new shoes! Have fun with your Mama! Happpy Birthady! so glad you got to spend time with your Mom!